Large Wooden Bulldozer Transformer appears to be a construction vehicle but with a few twists and turns it becomes a standing robot 21cm tall. 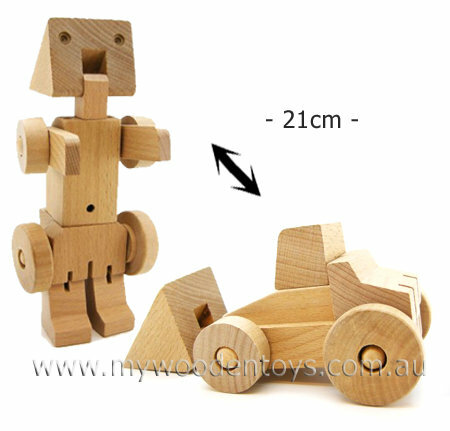 This clever toy is made from solid smooth wood and is held together with strong black elastic. By following the enclosed instructions you can manipulate it from a bulldozer to a robot and back again. A great puzzle to help with fine motor skills. A really clever toy and packaged nicely in a strong brown box. We like this because: "The way the Cranes cable becomes a tassel on the Robots head ."